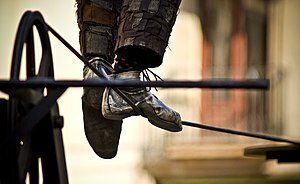 The tightrope walked by the Dom. We had an interesting exchange this morning. A propos something written in our book (which is not rule book, exactly) and fascinating chat at yesterday’s O&P. Anyway – the deal for us is that what he does is, he says, not for my hurt or shame. Hurt as in emotional hurt? Yes. Oh, so pain and embarrassment is OK then? “Oh, absolutely”, he said. And, after a pause: “You have no idea of the tightrope we Doms have to walk”. It was a light-hearted conversation, but it has a point. He likes to hurt me. he likes to see me blush with embarrassment. But, he likes me to look back and glow because he’s made me proud of what I’ve done for him. He says he hates it if I feels, looking back, degraded or shamed by his actions. Someone else made the point that “it’s because I can trust him [her dom] not to (intentionally) hurt me that I felt able to give up my limits. I know he will push me way outside of my comfort zone, but never so far that will cause me harm. I don’t envy him (or Belasarius) that responsibility”.